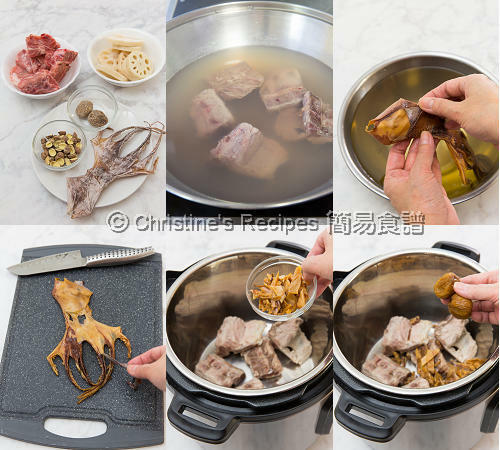 Have you tried this old-fashioned Chinese soup —— Lotus and Dried Octopus Soup? This soup is very popular and well-liked in Hong Kong. This soup tastes very delicious with a slightly sweetness and a depth of flavours. Traditionally, it’s a soup enjoyed in winter. To myself, it’s a soup can be enjoyed all year round. Chinese people like long-cooked soup (aka “old fire” soup in Chinese, 老火湯). It normally takes at least 2 to 3 hours or much longer to make an old-fire soup. The soup has a depth of flavours. Dried octopus (章魚) is quite often used in making Chinese “old fire” soups. Don’t mix it up with dried squid as a snack, which is marinated with seasonings. Dried octopus shouldn’t have any seasonings added, but simply have gone through a sun-dried process traditionally. It’ll bring a new dimension of flavours into the stock. To make this soup, you need to soak dried octopus in warm water to soften. Then cut it into smaller pieces (no bigger than 1-cm squares or strips), and then put them into the soup. I usually put one dried octopus (if it’s large) or two (if it’s small) to make lotus root or pork bone soup. The dried octopus will make a big difference in taste and aroma. Top right: Soak dried octopus in warm water to soften. Bottom left: remove the outer skin of dried octopus. 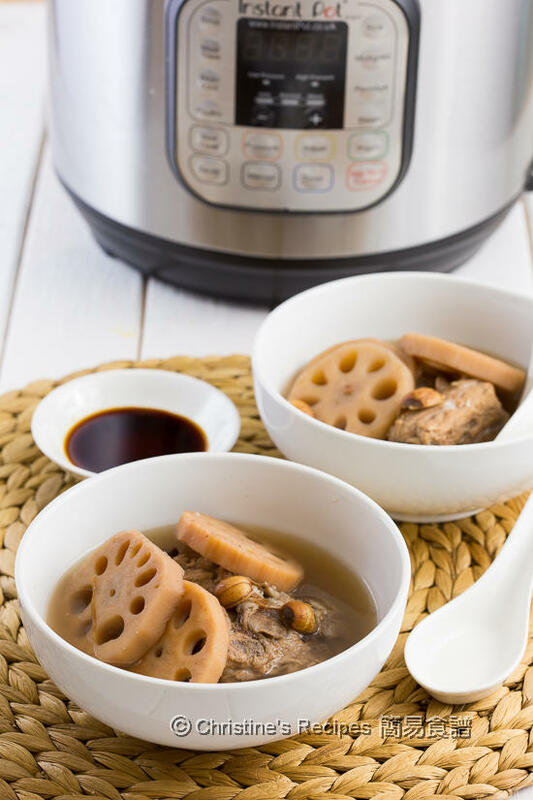 This time I used my Instant pot, an electric pressure cooker, to make the traditional lotus and dried octopus soup. It shortens a lot of cooking time, yet with the same flavoursome results. If you don’t get an Instant Pot yet, you still can make this soup on stove top. Both recipes are posted below for you all. Soak dried octopus until soft. You can easily remove its outer skin with a knife. Cut into 2-cm sized strips. Set aside. Blanch pork bones in boiling water to remove blood and impurities. Drain well. Set aside. 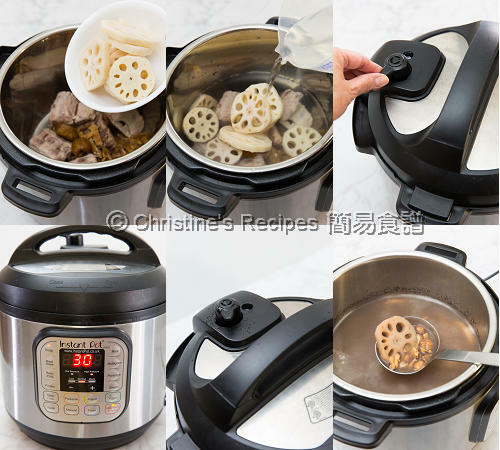 Put the pork bones, dried octopus, dried dates, lotus root and lotus seeds into Instant Por. Pour in 2 litres of water. Cover and turn steam release handle to the “Sealing” position. Set “Soup”, “High Pressure” cooking for 30 minutes. Press “Cancel”, quickly release the pressure. After the float valve drops down, remove the lid. Press “Saute” and cook about 10 to 12 minutes. Season with salt. Serve hot. Following the above instructions, prepare all the ingredients. Put all the ingredients into a large pot. Pour in 2½ litres of water. Cover and bring it to a boil over medium-high heat. Reduce heat to simmer for about 2 to 2½ hours. Season with salt. Serve hot. Dried octopus is available at Asian grocers, often packed in sealed plastic bags. I like to remove and discard the outer skin of dried octopus after soaking to soften. The soup will become clearer and lighter in colour. 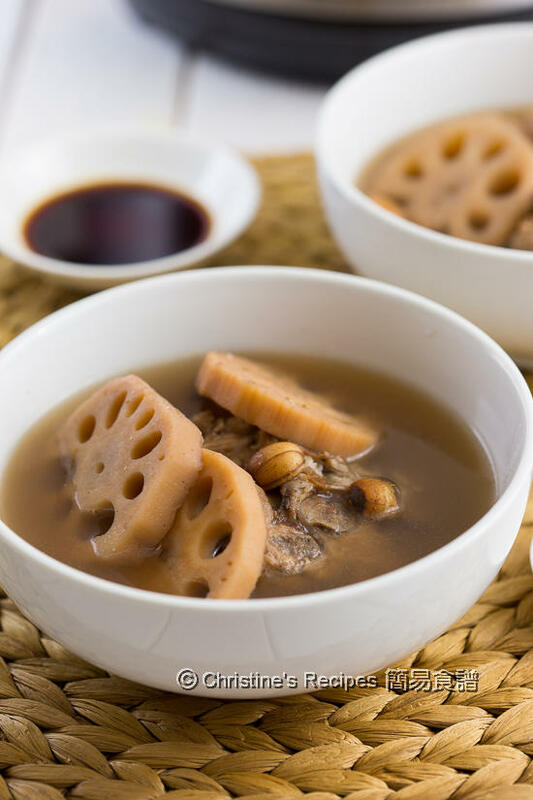 For convenience, you can use frozen lotus root, available at Asian grocers. It’s much cheaper than the fresh ones. o lotus roots...you have no idea how much I miss them. I don't see them here..not even the frozen one. The soup must be very delicious, Christine. Can you please explain to me the reasons for step 4? I don't understand why you have to "saute" for another 10 to 12 min. By cooking another 10 to 12 min with "saute" function, the soup will become more like Chinese luo-huo (long-boiled 老火湯) soup. Or you might skip this step if you want the soup to look clearer.